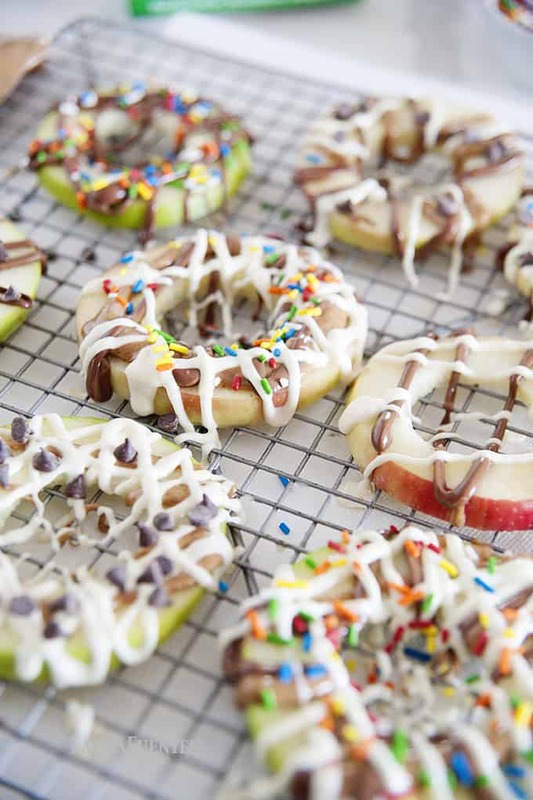 If you’ve never heard of a healthy apple donut, you are in for a treat today! One of the things I started using during my weekly meal prep after sharing my guacamole bar with you, is Natureseal’s for Fresh Cut Produce. Their simple blend of vitamins and minerals help prevent my fruit, like apples and pears, and veggies like celery, from browning after I slice them. And yes, these are real problems if you are preparing your fruits and vegetables ahead of time, putting them out for a party or when meal prepping for the week! The whole purpose of preparing all your fruits and vegetables at once is to be able to have them on hand, and ready to use, to make healthier choices throughout the day. In the afternoon and during the weekends, neighborhood kids will come over and play, and it never fails that shortly after coming inside from playing they all want a snack. I recently introduced them to apple “donuts, ” and now it’s the newest and coolest “thing” at my house. 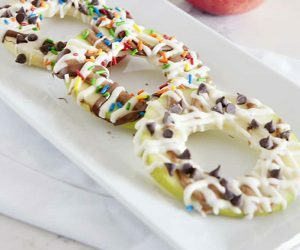 What’s great is that all I have to do is take out the prepared apple slices, which I’ve previously soaked in the Natureseal solution for 1-2 minutes per side and stored in the fridge, and line up the toppings on the counter. As you can see in the video below, the whole process is fast and seamless, since the apples get soaked immediately after being sliced. This same method can be done with celery, carrots, pears, and other fruits ahead of time when you meal prep for the week and want to keep them fresh in the fridge without browning for up to 14 days. Just like the fruit you find pre-cut at the grocery store but without paying a premium. On weekdays, I don’t usually put out the chocolate, just a nut-free butter (you could use peanut butter if no one is allergic to nuts), granola, shredded coconut, and sprinkles. Yes, I did say sprinkles. I’m convinced it’s the sprinkles that wins them over every time. 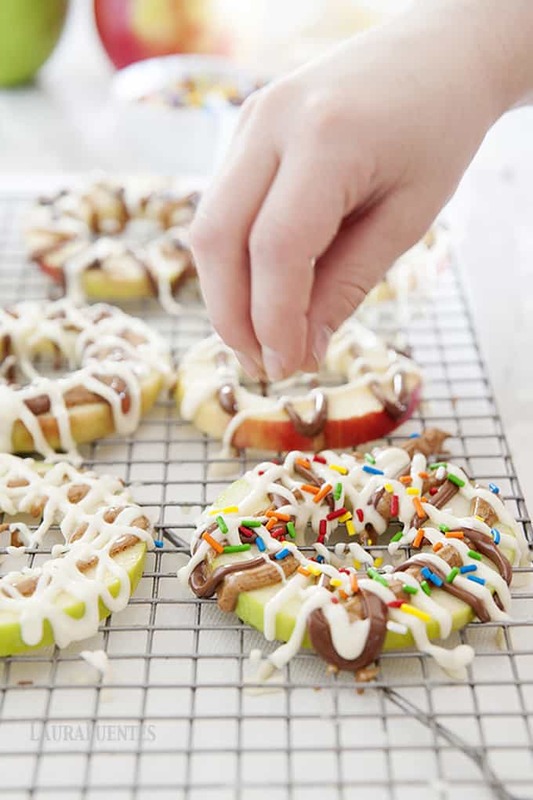 After seeing the success of this DIY apple donut idea with my kids and their friends, I’ve also made them for parties. 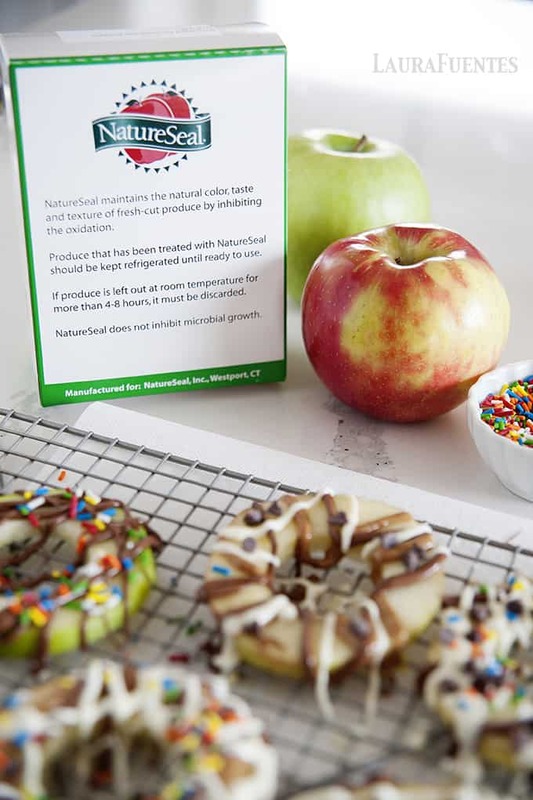 Since the apples have been protected from browning with the Natureseal solution, I no longer hear the kids complain about brown apples or worst, have to throw out the apples at the end of the party because they are looking yucky –kids. 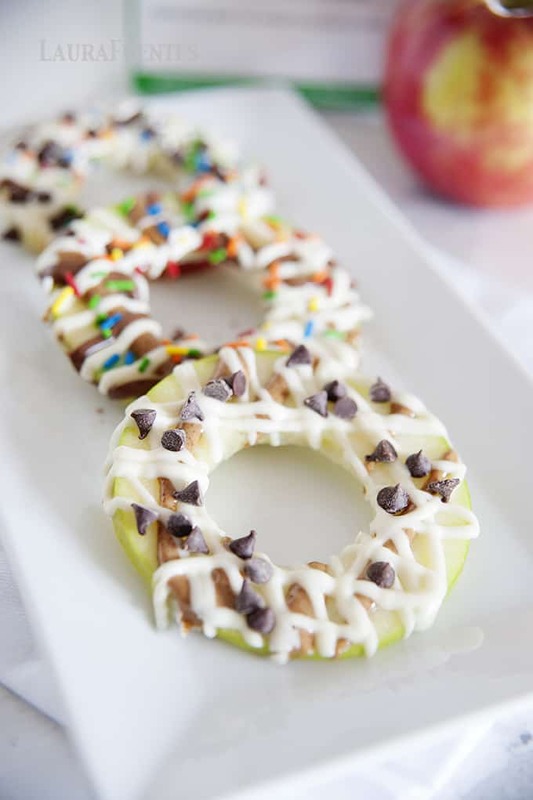 What are some of the ways you like to use up apple slices? Colored sprinkles, mini chocolate chips, unsweetened coconut, granola, raisins, ground cinnamon etc. 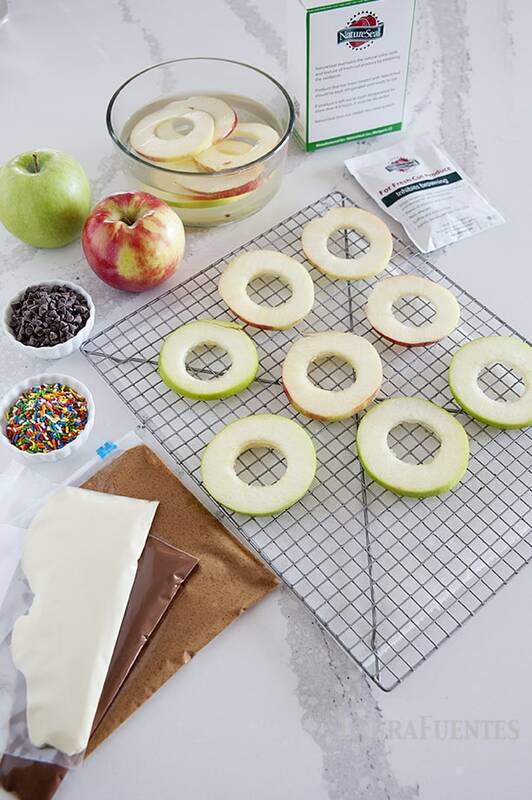 Cut apple slices into 1/3 inch-thick slices. 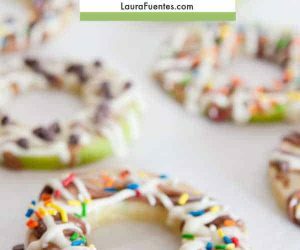 With a round small cookie cutter, apple corer, knife, or melon baller, remove the core. Prepare NatureSeal browning inhibiting solution according to package directions by mixing one packet with 8 ounces of cold water. Transfer liquid into a flat 9×9 baking dish or smaller baking pan. Begin to dip one side of the apples, flip over, and let apples sit for 1 to 5 minutes. Remove apples from the dish, transfer into a zip bag or storage container, and repeat the process with remaining apples. Melt chocolate and nut butter (or nut-free butter if serving it to other kids with possible food allergies) in a microwave safe bowl for 30 seconds. Stir chocolate chips and transfer them into a zip or piping bag. 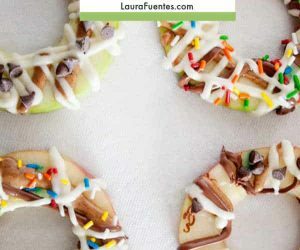 Place apple slices onto wax or parchment paper and let the kids drizzle chocolate or nut butter over the apple slices. Top with favorite toppings and enjoy! 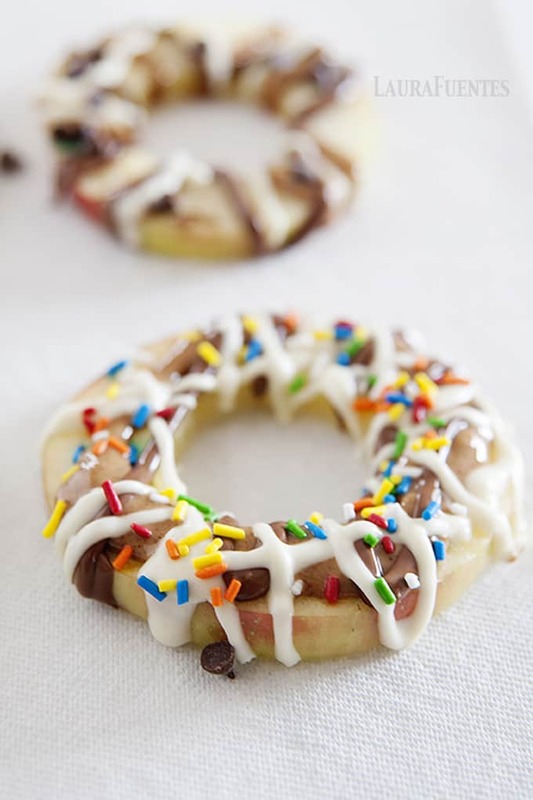 Store leftover apple rings in the refrigerator. This post was part of my partnership with Natureseal. Thank you for supporting the companies that help me do what I love most: create great recipes for you! All opinions in the post are my own. 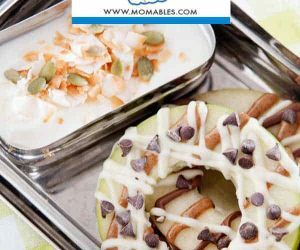 We enjoy our sliced apples in a dip of yogurt, almond (or peanut) butter and cacao nibs. We put leftover apple slices in the dehydrator and eat them that way or I make my own trail mix and add the dehydrated slices to that. I enjoy a plate of sliced apples and cheeses. I love it and everybody else in the family does too!